National Rail Enquiries (http://www.nationalrail.co.uk) (NRE) has launched a new version of its site optimised for mobile users (http://m.nationalrail.co.uk/), providing rail travellers everywhere with instant access to up-to-the minute train information in the palm of their hand. The mobile site boasts a new look and feel aligned with the main NRE website and offers commuters and other rail passengers a vastly enhanced user experience through stripped-down code, delivering super slick page load times and easy to access real-time information. Since going live with the new version, access to the main NRE website from mobile devices has gone down by 29 per cent, while usage of the mobile version is up 129 per cent. The number of unique mobile visitors has also increased by 267 per cent. 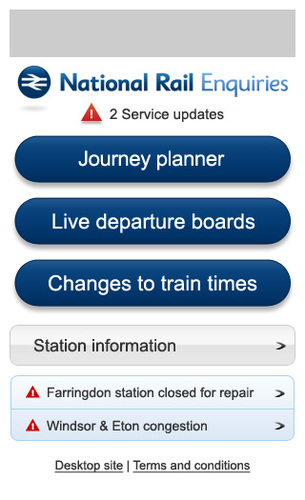 Designed and built by digital agency Fortune Cookie (http://www.fortunecookie.co.uk) , the new site also makes information about travel disruptions, especially during bad weather, easier and quicker to find and introduces the ‘station picker’ drop down list to mobile visitors for the first time. Mobile users can also access station information to find out about local facilities, such as car parking and refreshments. For more information about National Rail Enquiries visit www.nationalrail.co.uk <http://www.nationalrail.co.uk> . National Rail Enquiries (NRE) is the definitive source of information for all passenger rail services on the National Rail network in England, Wales and Scotland. NRE is part of the Association of Train Operating Companies (ATOC), which is responsible for providing business services to the Train Operating Companies. NRE handles an average of 1.3 million journey enquiries every day either through their contact centres or self service channels. This press release was distributed by ResponseSource Press Release Wire on behalf of Six Degrees Limited in the following categories: Consumer Technology, Travel, Media & Marketing, for more information visit https://pressreleasewire.responsesource.com/about.